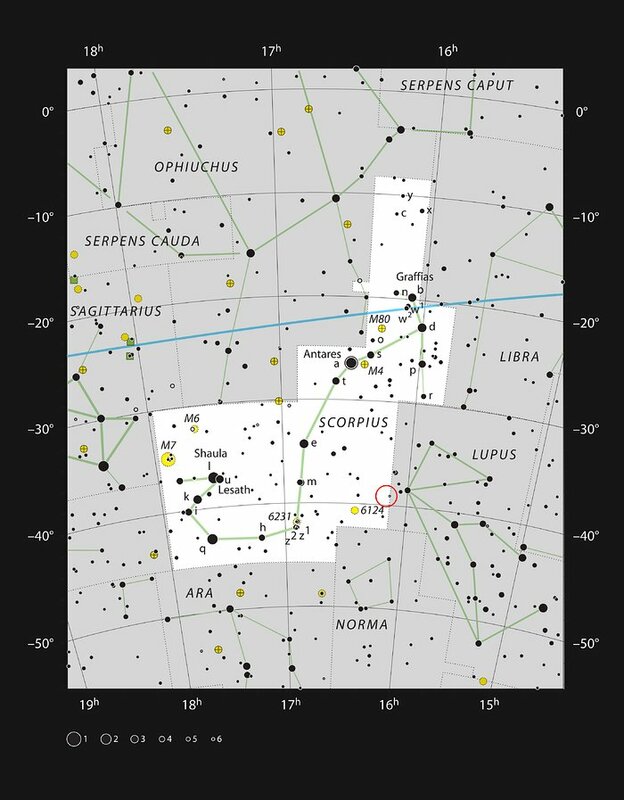 The Lupus 3 star forming region lies within the constellation of Scorpius (The Scorpion), only 600 light-years away from Earth. It is part of a larger complex called the Lupus Clouds, which takes its name from the adjacent constellation of Lupus (The Wolf). The clouds resemble smoke billowing across a background of millions of stars, but in fact these clouds are a dark nebula. Nebulae are great swathes of gas and dust strung out between the stars, sometimes stretching out over hundreds of light-years. While many nebulae are spectacularly illuminated by the intense radiation of hot stars, dark nebulae shroud the light of the celestial objects within them. They are also known as absorption nebulae, because they are made up of cold, dense particles of dust that absorb and scatter light as it passes through the cloud. Famous dark nebulae include the Coalsack Nebula and the Great Rift, which are large enough to be seen with the naked eye, starkly black against the brilliance of the Milky Way. Lupus 3 has an irregular form, appearing like a misshapen snake across the sky. In this image it is a region of contrasts, with thick dark trails set against the glare of bright blue stars at the centre. Like most dark nebulae, Lupus 3 is an active star formation region, primarily composed of protostars and very young stars. Nearby disturbances can cause denser clumps of the nebula to contract under gravity, becoming hot and pressurised in the process. Eventually, a protostar is born out of the extreme conditions in the core of this collapsing cloud. The two brilliant stars in the centre of this image underwent this very process. Early in their lives, the radiation they emitted was largely blocked by the thick veil of their host nebula, visible only to telescopes at infrared and radio wavelengths. But as they grew hotter and brighter, their intense radiation and strong stellar winds swept the surrounding areas clear of gas and dust, allowing them to emerge gloriously from their gloomy nursery to shine brightly. These two stars are still very young — so young that nuclear fusion has not yet been triggered in their cores. Instead, their brightness is caused by the conversion of gravitational energy into heat as their turbulent cores contract. Understanding nebulae is critical for understanding the processes of star formation — indeed, it is thought that the Sun formed in a star formation region very similar to Lupus 3 over four billion years ago. 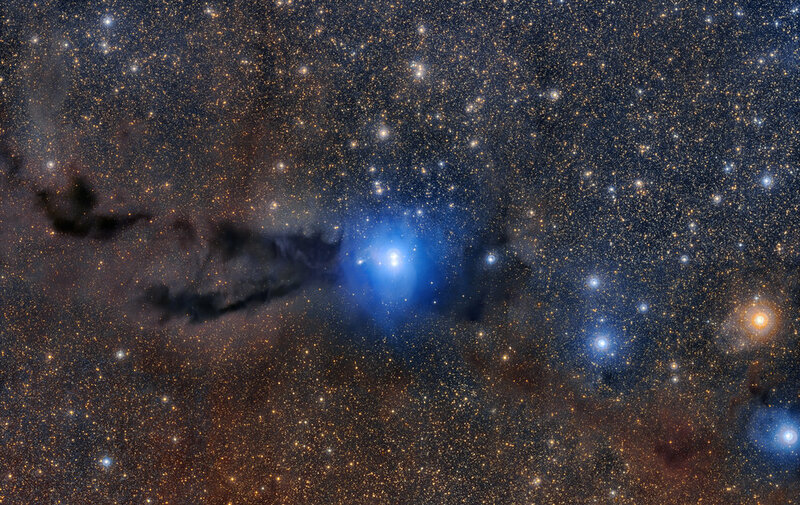 As one of the closest stellar nurseries, Lupus 3 has been the subject of many studies; in 2013, the MPG/ESO 2.2-metre telescope at ESO’s La Silla Observatory in Chile captured a smaller picture of its dark smoke-like columns and brilliant stars (eso1303).